I've trying a few hippy-dippy type products such as the Medi-Mix soap to try and get rid of my cradle cap or whatever it is recently, so I thought I would try something more medicated instead. 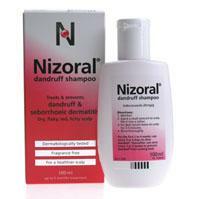 I went to Boots and studied the hair-care products and spotted Nizoral anti-dandruff shampoo. It's designed for the treatment and prevention of scaling of the scalp (seborrhoeic dermatitis), which is what I suspect I have. It has an active ingredient in it called ketoconazole, which is a synthetic anti-fungal drug. Interestingly it also contains coconut fatty acid - not so hippy dippy now huh? Because I'm sceptical about all products these days I just bought the smallest bottle (60ml), I think it was about £6. What is the shampoo like? Nizoral shampoo is a bright red/pink colour - kind of like the packaging. It smells like pure alcohol, and all in all, is not very nice to use. It doesn't lather that well and I needed to use more than I would have liked to to get all of my hair washed. Like many of the scalp treatment shampoos I have used recently, you have to leave the Nizoral on your scalp for about 5 minutes to give it time to work. I used the Nizoral shampoo for about 2-3 weeks and did not see any improvement to my scalp - in fact I thought the MediMix soap was more effective. To be fair, it says you're supposed to use it for a full 4 weeks, but as it actually seemed less effective (and more unpleasant to use) than other things I tried I stopped using it. I wasn't impressed with the Nizoral shampoo so I am going back to the doctors soon about my eczema so am going to ask for something specifically for my scalp. I've finally got in to see the dermatology specialist at my surgery and I really hope she can help me. The doctor prescribed me Capasal shampoo. But I have also discovered Jason dandruff shampoo, which I like much better.